The lens has a focal length of 10-24 mm. Since the lens is designed to be used on a camera with smaller sensor ('APS-C') the focal length will be equivalent to 16-38 mm if you have a Canon camera or 15-36 mm if you have a Niko camera. If you buy this lens it will come with a lens hood, whose model name is "AB001". 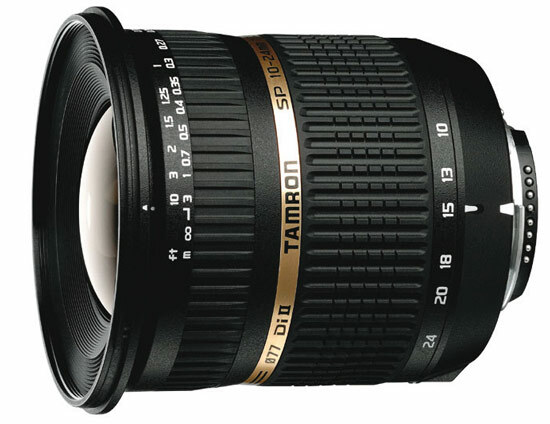 Tamron was first to offer the 10-24mm ultra wide-angle 2.4X zoom perspective for digital SLRs, successfully resolving numerous optical engineering challenges. Rendering picture angles approximating 16 to 37mm in the 35mm (film) or full-frame DSLR formats, landscapes, streetscapes, architecture and confining interiors come to life beautifully. Images exhibit negligible distortion in normal use, but—if the photographer chooses—spectacular effects can be introduced by disregarding the camera´s relationship to level. Please note that Di II lenses are made for the exclusive use on digital SLR cameras with image sensors smaller than 24mm x 16mm. Di II lenses cannot be used together with a full format or 35mm SLR camera, as their image sensors are not able to cover the entire area of full format resulting in dark corners of the (i.e. vignetting becomes noticeable)."